It is well known that US President Donald Trump does not like animals and does not keep them - unlike the majority of his predecessors - in the White House. He made only one "exception" - for Secretary of Defense James Mad Dog Mattis. However, this is almost in the past. Persistent rumors about this have been going on for several months, as well as that White House is secretly looking for replacement for Mattis. However, after the words of Trump himself that the current head of the Pentagon “may be gone,” and the president’s explanation why - because he is “a kind of democrat”, Mattis’s resignation in the very near future without any doubts. After all, according to Trump, the “good man” will now simply have to ask the president for resignation. Without waiting for Trump to demand it himself. Moreover, when the president frankly hints that he has already selected candidates for this and other positions. 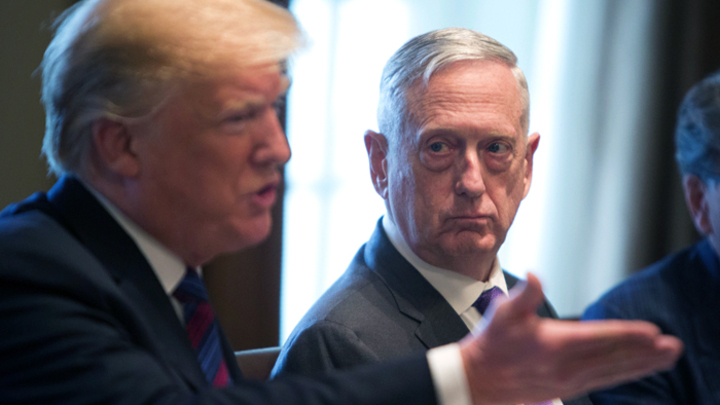 Calling his defense minister "a democrat," a word that Trump says is a curse, the White House's head hint why he wants to get rid of Mattis - because Mad Dog was not enough "mad" and clearly disappointed the Supreme Commander of his excessive, according to his opinion, caution. Like any sofa strategist, Trump is more belligerent than a professional military man, who knows better and represents the real possibilities of his army, how easy it is to get involved in a war, and what it can lead to. Mattis is not a careerist and he has self-esteem, and therefore he will hardly hold on to his post when the head of state and commander-in-chief humiliates him live on a popular TV channel. Moreover, the president has publicly declared his intention to part with other figures from his entourage, as he "has the authority to do so." This fate has not escaped even Trump's favorite, Nikki Haley, theIt would be strange that in an atmosphere of mistrust and hidden threat that prevails in the White House, about which Trump honestly told in the same interview, he would allow to remain cool, but at the same time prudent general. Moreover, the president is well aware: Mattis thinks - and does not hide it - Trump is a big, naughty child who has to be kept in check, because the president is not well versed in military affairs and would not mind sometimes using the military as clowns. The Washington Post and the New York Times reported the president’s intention to get rid of Mattis after the mid-term elections in early November, because to do it on the eve of the elections would be to harm Republicans. However, if the head of the Pentagon voluntarily leaves it is another matter. All serious observers agree that Mattis is among those, according to Trump, “a few people” in his administration that he “is not enthusiastic about”. When and why did Trump clash with Mattis? It is for certain known about Trump's disagreements with Mattis. For example, the latter was against the military action against North Korea, insisting on a diplomatic solution to the problem of Pyongyang’s nuclear program. And when the impulsive Trump, after the success of this particular course, fell in love with Kim Jong-un, Mattis was against the abolition of traditional joint maneuvers with South Korea. The main controversy between Trump and Mattis is Iran. The current head of the Pentagon does not approve of the US withdrawal from a nuclear deal with Tehran, knowing full well what a terrible war in the Middle East this could lead to. Meanwhile, to draw Americans into their clashes with Iran, especially in the military, is the dream of the current Israeli authorities, who are so favored by Trump. Mattis was not thrilled when Trump defiantly frightened NATO that the United States would not “protect” its members if they did not increase their military spending. Apparently, he understood better than the president that if Europeans are constantly humiliated in this way, they will more quickly mature to the European Army, which one day will not be with NATO. Of course, in the disagreements that divided the Supreme Commander and his Secretary of Defense, Trump was not always wrong. Both cared, above all, about their own interests. For example, Trump, for example, initially proposed to remove American troops from Afghanistan, where they only suffered losses in vain, losing a lot of money. Trump even now periodically declares that it is also necessary to leave Syria, where the Americans do not shine after the Russians appear, voicing also the enormous sums that the US has already spent in vain in the Middle East. However, as long as Trump is president, the last word will remain with him. Not on strategic issues, of course, but on personnel issues. And the inevitable very soon resignation of Mattis will be another confirmation of this. permanent representative of the United States to the United Nations, who will resign by the end of the year.